The seaweed after going through the drying process. LAHAD DATU: Everything begins with dreams, but dreams will remain such without hard work and sacrifice. Daring to dream of making changes for his family, Suhailly Waydie, 45, invested everything he had, including his career, to become a seaweed and fish farm operator. Starting in 2015, Suhaily who received full support from his wife, Ratnah Kassim, 44, and their four children, opened up a company with his partner, Albani Dammani who had experience in the field. 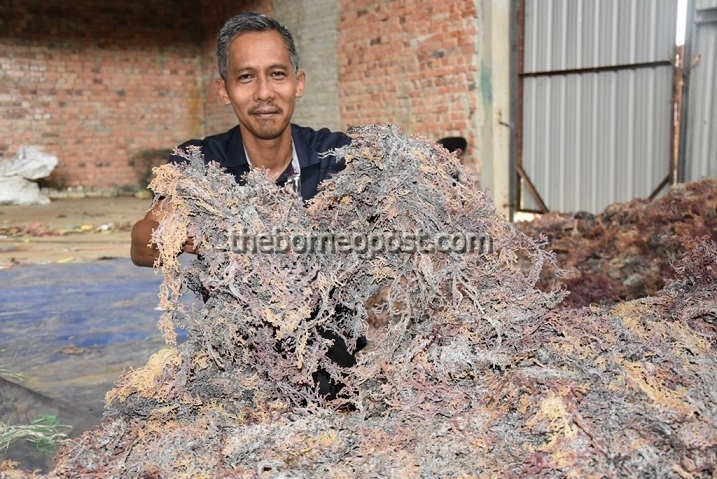 Suhaily said Albani Enterprise Sdn Bhd was established after his partner, Albani saw his passion to become involved in this field and the potential of seaweed and fish farming in the area. He said they faced various challanges to achieve what they had today and one of the challanges was his limited knowledge in this field. “But this did not break my spirit. I did everything I could to gain knowledge including learning from my partner, reading aquaculture books, thesis studies, magazines and surfing the internet to find out everything about this field. “We are also very fortunate as the government through the Fisheries Department, especially the Lahad Datu branch has always been there for us, not only to provide knowledge but also to guide us until today,” said Suhaily, who was born here in Segama. According to Suhaily, believing that he could achieve his dream, they started to plan and work on it. They opened up the seaweed and fish farm at the Bangkaruan waters, about 30 kilometeers from Lahad Datu. Utilizing the suitability of aquatic plants and unique factors in Bangkaruan, including its strategic location as it is not exposed to the open sea, undamaged and rarely visited, they began to grow the Tambalang type of seaweed. Suhaily said since harvesting the seaweed, the company’s harvested and dried seaweed has been recognized for its high quality due to its growth factor in Darvel Bay. It was learnt that Darvel Bay is rich in marine food resources and supported by the research conducted in the Coral Triangle which found that seaweed is suitable and has great potential to be grown here. In addition to his seaweed farm of about 90 acres, Suhaily also works on fish farming in five acres of water area. According to Suhaily, his efforts did not stop even after successfully producing seaweed of up to 30 tonnes per month. He continued to work and expanded his business. Suhaily said in 2017, with four entrepreneurial partnerships, Heng Seng Trading was established for operation in Merabong, Tungku, about 52km from Lahad Datu. He said they are working on the one acre of land from 15 acres that was applied for the operation of the fish-loading jetty for five companies and surrounding fishermen. Even though he has reached his goal and was living his dream, he will not be complacent and will continue to strive to achieve greater dreams. “In the future, I want to build a factory that will utilize the machine technology innovation such as vacuum technology in which the fish-separating process will be handled more systematically. “With this technology, it will save time and energy and could also ensure the fish loaded in lorries are still fresh,” he said, adding that it will give a guaranteed market value of fish when it comes to the market, especially among consumers. In the meantime, Suhaily said his company also aims to utilize fish catches by developing them into quality products such as producing fertilizer products and animal feeds. He said the efforts are in line with generating downstream industries in Tungku which could also utilize the expertise of labor in aquaculture by developing laboratory research results for local fishermen. Therefore, he urged the people, especially the younger generation to not only dream, but believe it, plan and work on their dreams. He said their dreams will not just happen. They need to plan out a strategy for achieving the dream because achievers work on their goal while those afraid of changes will remain sitting on their sofas.